Sections of the boom may be used together, or separately. Box Dimensions (LxWxH) 58.0 x 7.0 x 7.0"
Heavy Duty Boom Arm, Black - 9' (2.7m) is rated 4.3 out of 5 by 31. Rated 4 out of 5 by Todd from Columbus from Exactly as advertised! Nice unit. Yes it is nine feet long. mine came shipped in a heavy duty cardboard tube. It is very durable. Easily holds my Alienbee's B800 or B1600 strobes with whatever light modifier i choose to hang on it (beauty dish, softbox, etc). Perfect for hairlight set-ups. Pole section breaks down into 3 peices. They join together via an aluminum slug that slides into the two joining poles and is secured by two hex key screws. Very solid and you use only 2 sections if you do not need the full 9'. The counter weight is nice and heavy and does the job. Also includes several wire clips to hold the wire to your lights to the pole. Nice unit. Rated 5 out of 5 by Robert from Light but strong It's a trade off whether to over design the boom and suffer the consequences of carrying what feels like a steel girder or making a compromise in weight and hope for the best. I hung a DigiBee with large light box over some long table products and found I had made the right choice. I wish I had steel girders on a higher ceiling, but with a properly placed counter weight this managed admirably. Light weight but not weak. I suggest spraying some dry lube on the parts that slip together, because they are snug and can become a two person job to separate otherwise. Very happy with this purchase. Of course I don't think anyone has ever gone wrong buying Manfrotto. Rated 4 out of 5 by Constantspeed from Great Boom Arm Sturdy, robust, boom arm with a long reach. Could use more detailed instructions for assembly, since there are none as it is, but mostly intuitive to figure out. The critical missing piece, as mentioned in other reviews, is the set screw for locking onto a light stand. Manfrotto should include this, or at a minimum, list the size and type needed in the instructions and description of the product. Seems like such a small item and detail not to include, but critical. Would be nice to have this ready to go out of the box. A big thank you to the other reviewer who listed the size---an M6 (metric) thumb screw. Rated 4 out of 5 by RNCotton from Excellent Manfrotto build, but be aware Manfrotto always produces a high quality product, and this boom is no exception. Assembly is a breeze and the required hex key wrench is included. One thing to be aware of, and everyone complaining that the boom was missing the thumb screw is making a grave mistake. This boom is not designed to mount on a light stand with a 5/8 tip style. 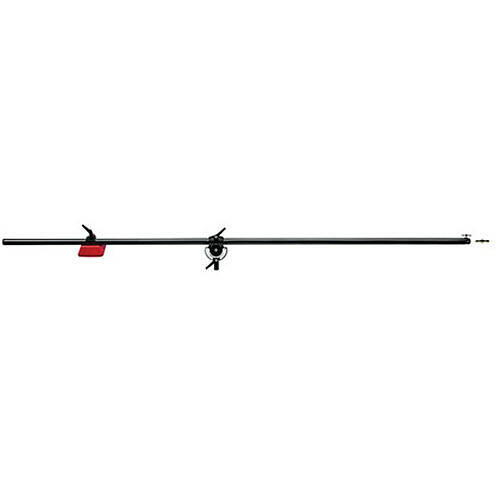 This boom is designed to mount onto a heavy duty stand with a 1 1/8 receiver. What looks like it should go over a light stand tip and use a set screw to tie it down is actually the stud itself, designed to drop *INTO* a 1 1/8 receiver, such as you'll find on the Manfrotto 008BU Cine Stand. My only complaint was the lack of user manual. I was able to assemble it properly without the guide, but it would be reassuring to have a manual to read any warnings and to know that I have the counterweight attached correctly. Rated 5 out of 5 by Denny from A Great Boom for the Money I would have preferred the Super Boom with the handle controls but for my current budget this is an amazing and stable boom that will always have it's place. especially when considering portability. Having the 3 sections really helps this boom conform to your shooting area size. Yes, the tripod lock screw is not included but luckily I had one and will be purchasing the Manfrotto Cine stand shortly anyways. Rated 5 out of 5 by CE64 from Awesome Heavy Duty Boom This boom is a must for anyone with studio strobes or monolights. This is a heavy duty unit perfect for lifting a studio strobe and softbox above the subject. The boom pole is 3 sections joined with couplers. I often use only two sections with I am in more confined working spaces. The 3 section design appears to make the boom more rigid, however it is a little more cumbersome to extend out and balance the counterweight than the lighter weight 420B stand. This is my only knock on an otherwise outstanding product. Rated 5 out of 5 by Adrian from Amazing! How Did I do without this? It's SOLID! The think extends like forever. I can put my light right on top of my subject. It takes the weight od my Alienbee with a big softobox (pretty heavy) at no problem. Feels sturdy, and is very heavy. I love it. Rated 5 out of 5 by Anonymous from Manfrotto 3 section heavy duty boom This is a wonderful product for the price. I found the three section boom to be very heavy duty, but easy to put together. I had read before that it was hard because it didn't come with any instructions but I found it was easy to assemble and easy to use. One thing other reviews have mentioned is that it does not come with a screw to attach the pivot clamp to a light stand as it is meant primarily to work by dropping down into a manfrotto stand. Manfrotto needs to state this more clearly in the documentation that they sell the boom with or just provide the screw as part of good customer service and usability. I had to make a quick trip to the hardware store to get a screw as I did not want to go out and purchase the more expensive manfrotto stand when I already had 3-4 heavy duty stands in my studio. Other than that the boom does what it is intended to do support lights, beauty dishes, softboxes etc. Overall a good value. This boom arm was suggested by B&amp;H. I need a versatile system that will hold Buff Einstein and medium soft box with no problem? This is exactly what I use mine for. No worries what so ever! Yes this boom is compatible with the Manfrotto Alu Senior Air-Cushioned Stand with Leveling Leg (Black, 10.3'). I got this boom and stand used but I am missing a section. Can I buy one section or just the three sections with no weight or clamp? In Google find a parts drawing of the Manfrotto 085bs pole arm assembly. The individual bottom &amp; middle pole is (R085,03B). The connector piece is (R011,01).The top pole is (R085,04B). Suggest contacting Manfrotto or B&amp;H for further help. What maximum counterweight is recommended for this (420csu) boom stand? Is this B&amp;H#MA1004BAC Mfr#1004BAC an appropriate stand for this boom? My light + modifier weighs about 4-5 lbs. Do I need a steel stand to use this? The boom arms that are long like the one you picked all come with a counter weight.The ones that do not are shorter. This one is very good but is 83 maximum in length,Avenger D600 Mini Boom (Chrome-plated), B&amp;H # AVD600 MFR # D600.